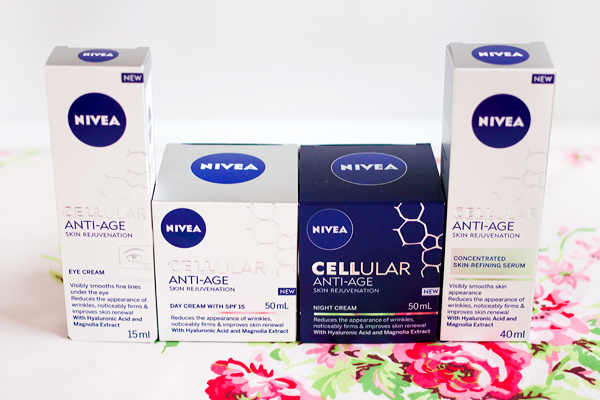 Recently I've been testing out the new Nivea Cellular Anti-Age skincare range. The Cellular Anti-Age range is intended for those with mature skin as the products claim to reduce the appearance of wrinkles, firm the skin & aid skin renewal. All of the products in this range contain a unique combination of anti-ageing ingredients including magnolia extract, hyaluronic acid & creatine. For me Nivea are one of those failsafe brands. There's a reason why millions of women rely on their products. The Cellular Anti-Age range feels like a step up for them as the products are slightly more luxurious. I'm not hugely into drugstore skincare products as they often don't agree with my skin but the ingredients in these ones sounded just as good as some high end stuff. Ever since Hydraluron launched I've actively looked for moisturisers that contain hyaluronic acid. Not only does it increase your skin's moisture levels & plump up the skin, it helps to keep blemishes at bay as well. Obviously I'm still fairly young but fine lines are starting to creep up on me & prevention is always better than cure. I've noticed some other pleasant effects on my skin from using these products so it's well worth taking a look at them regardless of your age. For me the surprise item of the range was the Nivea Cellular Anti-Age Eye Cream*. In general I tend to prefer eye gels as they feel much lighter & more refreshing on the skin. I didn't really expect much from this product but it is a truly lovely eye cream. You only need a tiny pinhead sized amount so this tube is gonna last for ages. The cream manages to feel lightweight & deeply hydrating at the same time so it's perfect for the delicate skin around your eyes. It has an instantaneous effect on my undereye area. My dark circles are immediately lightened. Any fine lines get plumped up and smoothed out. My eyes look brighter & healthier even without concealer. It's a really great base for your concealer too & helps to stop it from creasing as much. 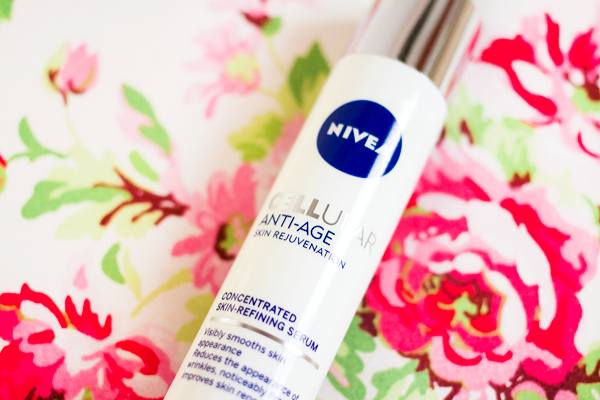 My favourite out of the four products has to be the Nivea Cellular Anti-Age Concentrated Skin-Refining Serum*. This serum feels incredibly hydrating! I sometimes feel like I don't even need to use a moisturiser afterwards. The texture is very silky which is probably due to cyclomethicone being the second ingredient on the list. I did worry that this serum would break me out as I sometimes react to excess silicone but my skin has actually been loving this stuff. This product is an intensive concentrated treatment so I've found that it has really helped to accelerate the skin rejuvenating process. I tend not to get full on blemishes anymore, just loads of congestion especially on my forehead. Ever since I started using this serum my forehead has been looking really smooth & clear. The fine lines in that area have been lessened also. It's such a great treatment that would be perfect for anyone prone to dehydration or congestion. 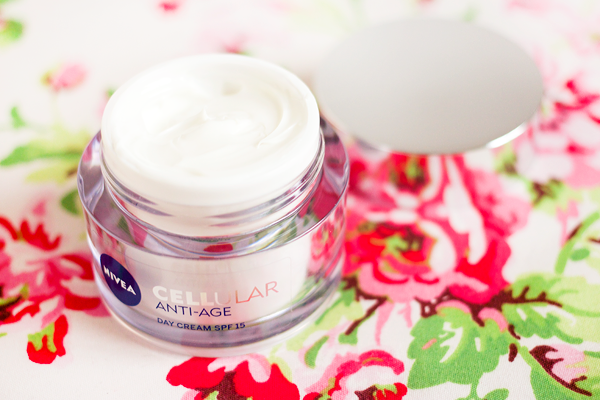 If you buy one product from the Cellular Anti-Age range, this should be it. A Nivea day cream was one of the first moisturisers I ever bought so it's interesting to see how they've improved over the years. 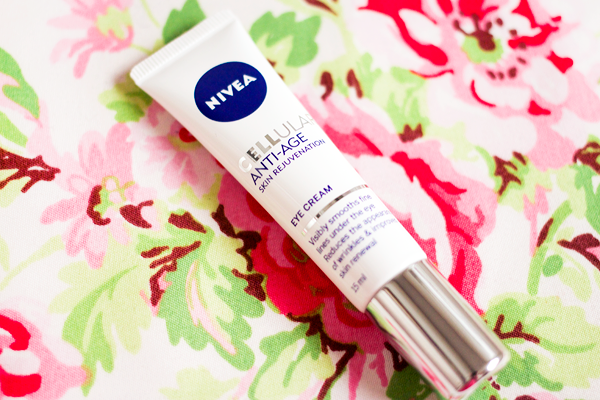 I absolutely love the buttery soft texture of the Nivea Cellular Anti-Age Day Cream SPF 15*. Both the day & night creams have that good old Nivea scent which is lovely & doesn't irritate my skin. I feel like this cream might be slightly too rich for my skin type though. It's really hydrating but it takes a long time to sink in & can sometimes feel a bit tacky. When it does finally sink in it does make my skin feel really silky & soft. It gives the skin a nice velvety appearance. As someone with combination skin though I need something a bit lighter during the day. I do like that it contains SPF 15 as sun protection is pretty much the only thing that can stop the signs of ageing. Anti-ageing products can reduce the effects but again prevention is better than cure. 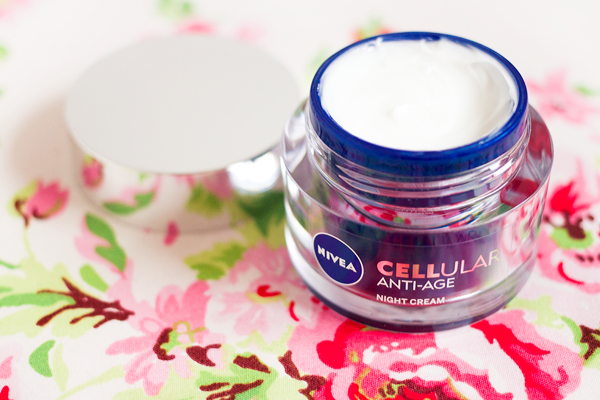 I'm really enjoying using the Nivea Cellular Anti-Age Night Cream*. This has that same buttery texture as the day cream but it's just a little bit thicker & balmier. It simply melts into the skin & feels so lovely to apply. It actually reminds me of the Origins High Potency Night-A-Mins moisturiser which is my favourite night cream ever. The main difference is that this has that traditional Nivea scent instead of a citrus one. Both creams boast skin renewal properties & I have to say that both of them deliver. When I wake up after using the Nivea night cream my skin feels amazing. It's so much softer, smoother & plumped up. My skin tone looks even & there's no dryness or tight feeling at all. Everything feels noticeably firmer too. This is a great night cream & is another one of those products that I think a lot of people would get along with. Overall I think this is a really strong range of products from Nivea. Even though they are intended for more mature ladies, anyone with dry or dehydrated skin would greatly benefit from using these products. Each product normally costs £14.99 but at this moment in time they're only £9.99 in Boots! This range has totally exceeded all of my expectations. It just goes to show that as long as you know which ingredients to look out for, your skincare routine needn't cost the earth. Are you a fan of Nivea products?